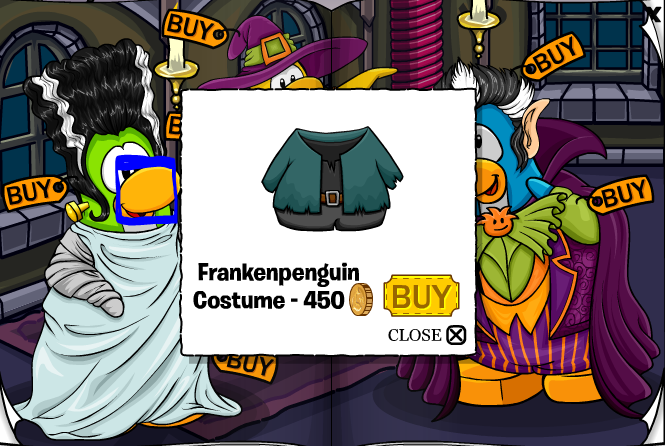 Advertise A Spare Penguin Here! I’ve got alot of stuff to worry about than updating a blog. Homework,schoolwork,friend problems, etc. And I just don’t seem to find blogging as awesome as it used to be when I was smaller. 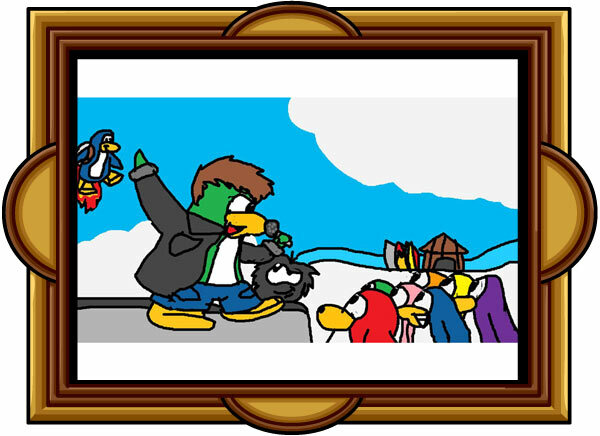 I’ve been blogging about Club Penguin for a very short time, I know. It’s only just been past a year of blogging for me. But as I said, I’ve got alot of other stuff to worry about. Ponytail 001, for helping me around browser cache problems and stuff. Superpinklove(I’m not sure if this is her CP name or not), for ALSO being one of the only people who @ me on Twitter, along with Carolinaatl1412. There have been quite alot of people who I couldn’t have made it here without. 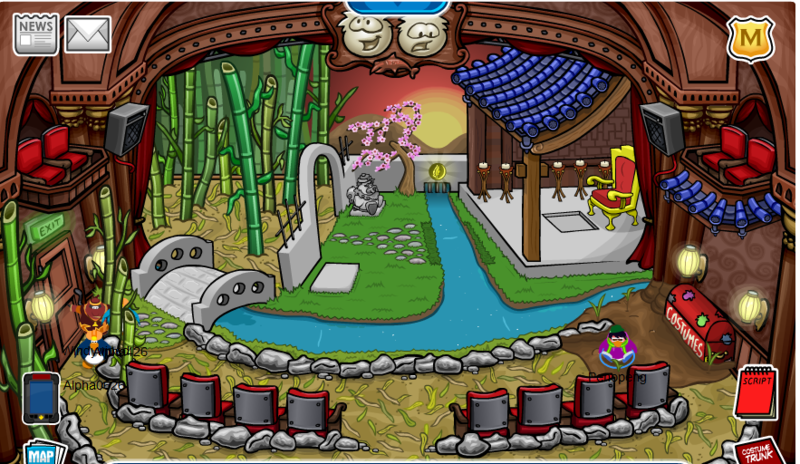 All my friends I’ve made on Club Penguin and everyone who has supported me. 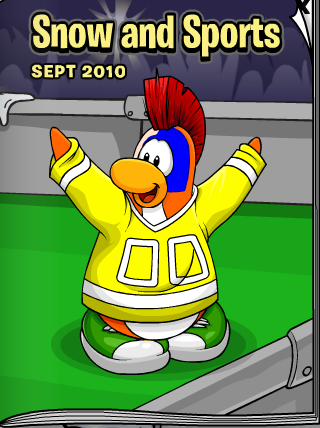 P.S: I still go on Twitter and CP. I haven’t quit either yet. Maybe I never will. Maybe. Just maybe. LATE! 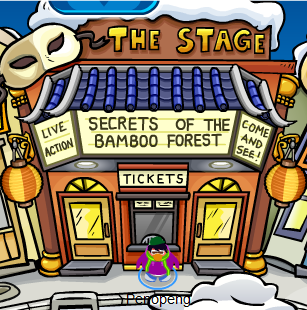 D= CPT Issue #260 + Secrets of the Bamboo Forest Returns! So very very sorry guys! 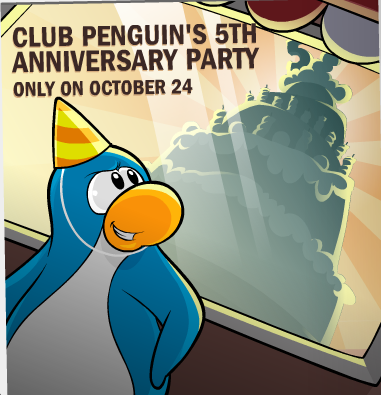 Club Penguin’s 5th Anniversary Party is on October 24th! You don’t wanna miss it, since it’s ONE DAY ONLY! 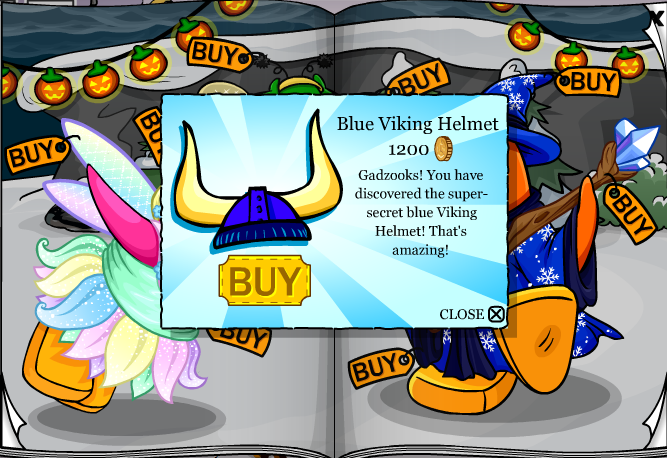 That’s pretty much it =) I’m trying to build up a few coins for the Phoenix Queen costume and the Guardian Dog xD And at the same time, getting the rest of my Cart Surfer stamps. Late Post! 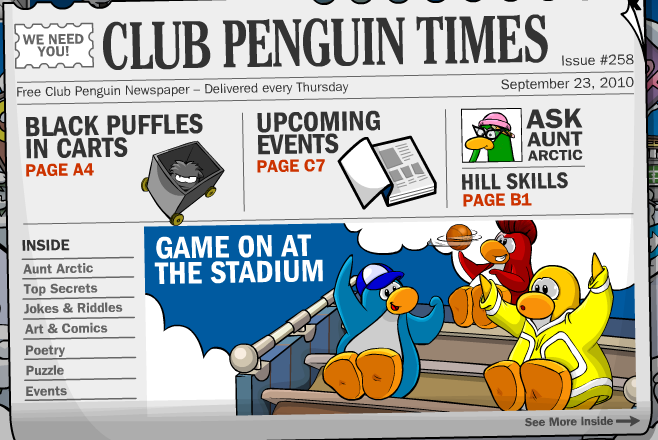 Newspaper Issue #259 + New Penguin Style! So very sorry guys! My Internet’s kinda been down the last two days, so I couldn’t post! Anywho, Issue #259 of the CPT was out on Thursday. 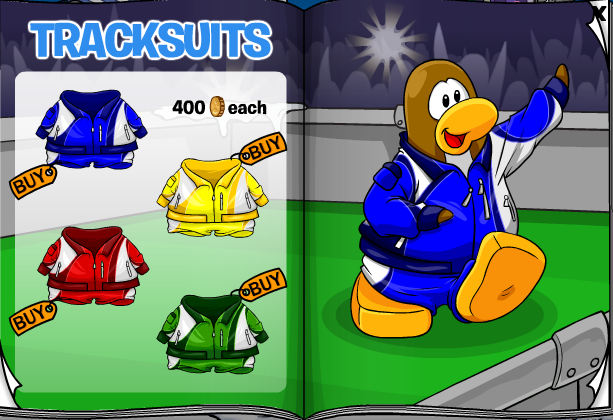 I’ll post you the new Catalog after I’m done with the newspaper. Don’t worry,peeps. 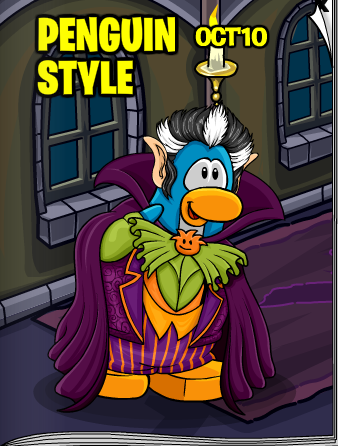 Now, I’ll show you the new Penguin Style catalog! 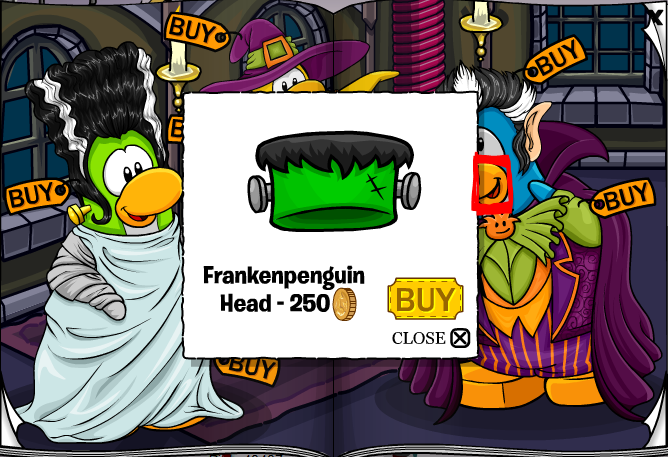 On Page 2: Click on the Count penguin’s beak to the Frankenpenguin Head. 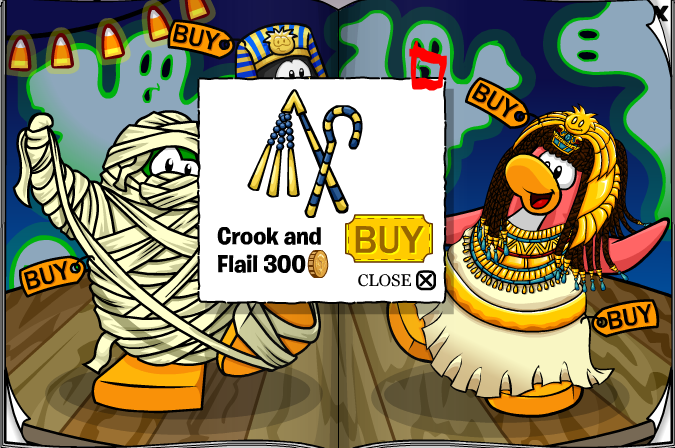 On Page 4: Click the Ghost’s mouth to get the Crook and Flail. 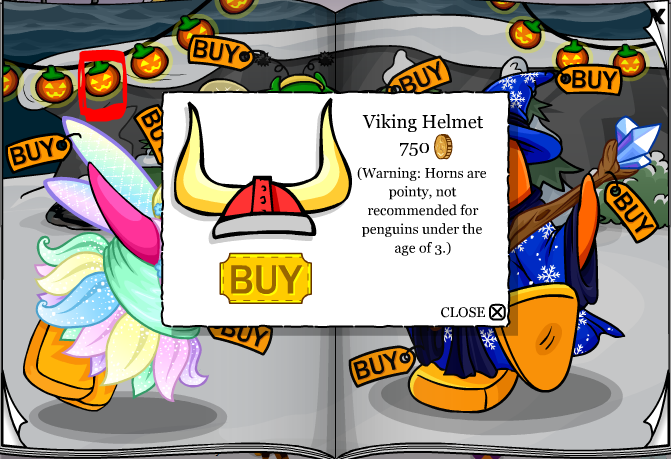 On Page 5: Click on the Jack-O-Lantern thingy to get the Red Viking Helmet, then click it 4 times again to get the Blue Viking Helmet. Holy cheesepie! My fingers are all worn out xD Please tell me if I’ve missed out any cheats. 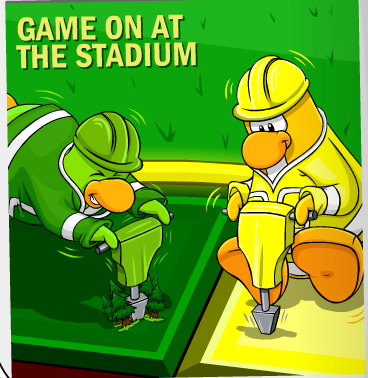 Snow & Sports Catalog (Sept. 2010) + Stadium! 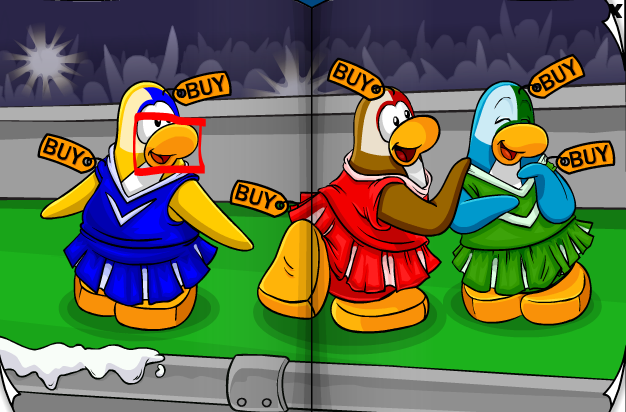 I have the new Sports catalog to show you guys! 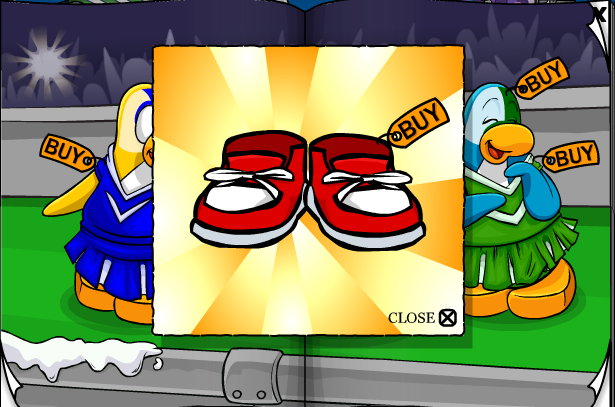 On page 2: Click on the Red Team cheerleader’s foot to get the Red Sneakers. 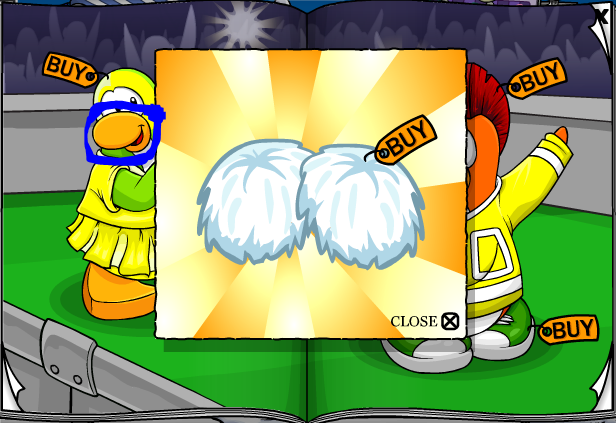 On page 3: Clcik the Yellow Team cheerleader’s beak to get the White Pom-Poms. 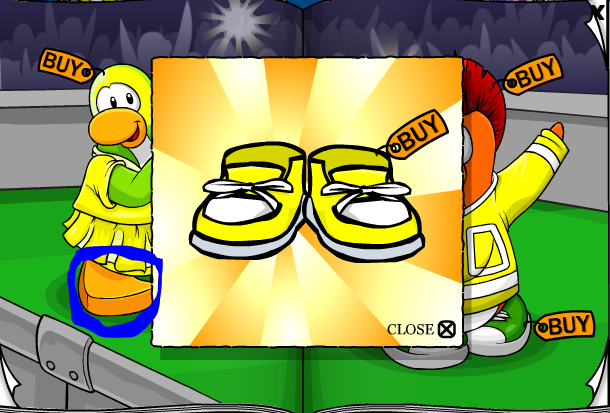 Click on the cheerleader’s foot to get the Yellow Sneakers. 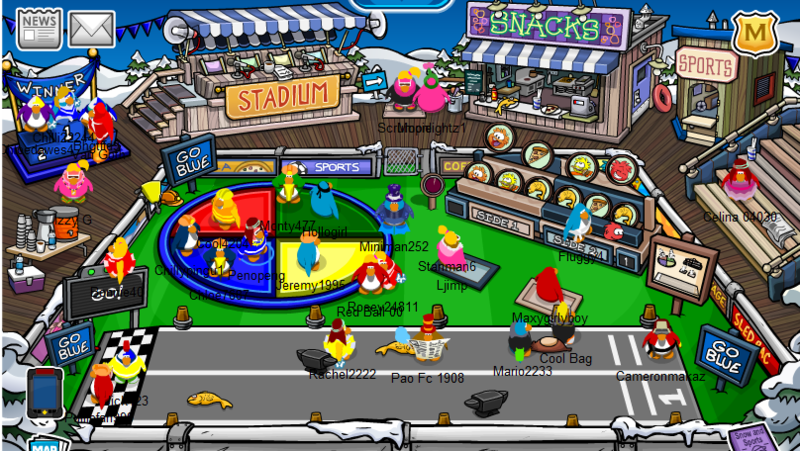 The Stadium has been set up for the activities! 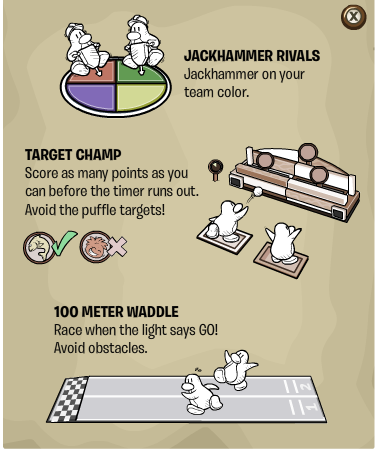 Here’s the poster that explains how to do the activities! So, yup! Enjoy the activities! 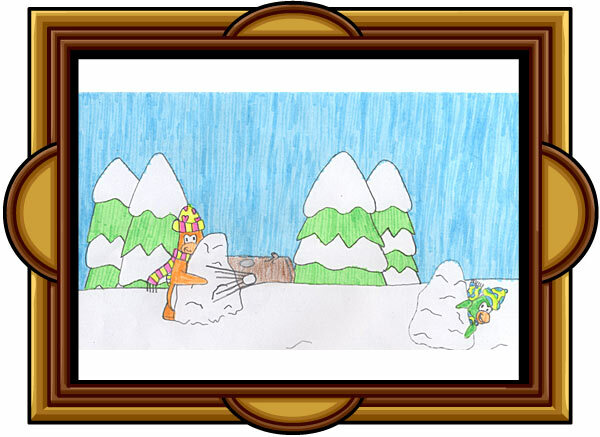 Submit Art for Anniversary Party! I should’ve posted this one yesterday…. anyways. Billybob has another post for us! 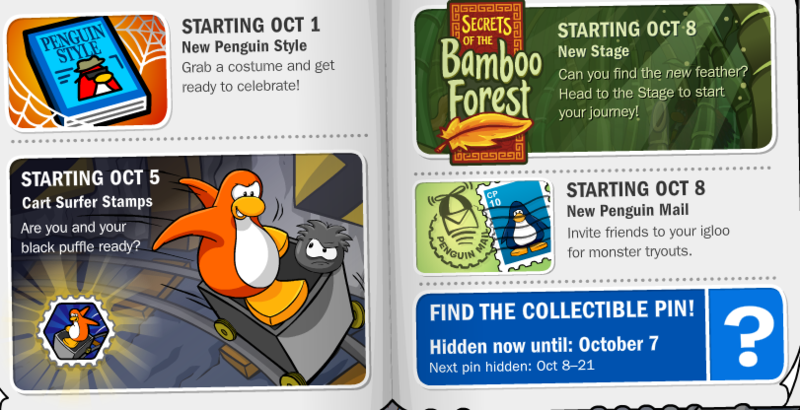 Today marks exactly one month until Club Penguin’s 5th Anniversary Party. 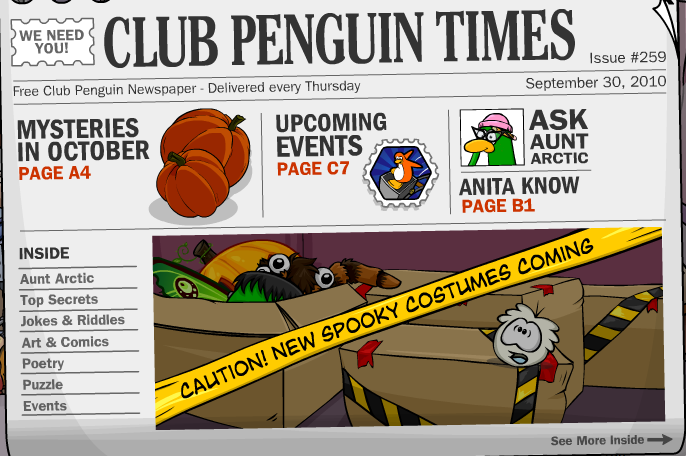 It’s on October 24 for one day only. And you’re all invited to come and celebrate!! 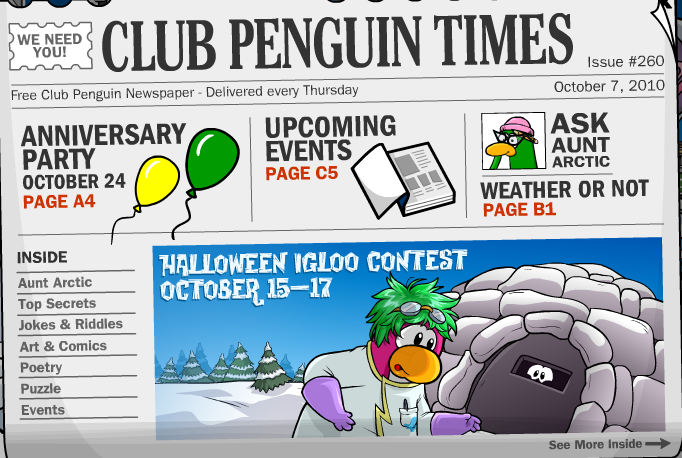 Stay tuned for more info about this year’s Anniversary Party. In the meantime, share your best memories in the comments! 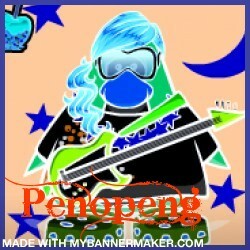 I was back from my vacation AGES ago. But I was too lazy to post xD Anyways, I’m back to posting now! There’s been TONS of talk about Stamps! 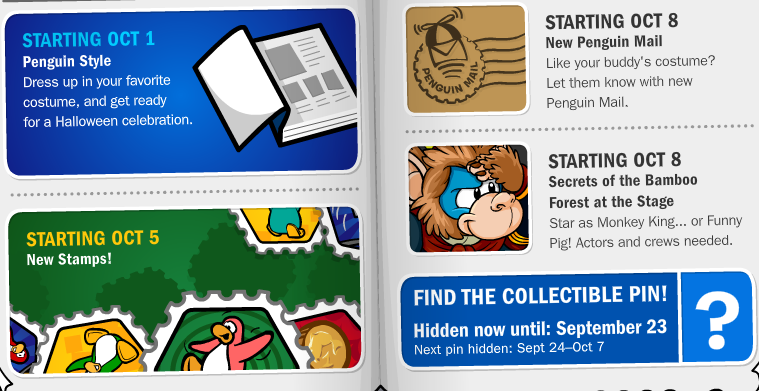 As you probably know, your Stamp Books will arrive on July 26 and you’ll be able to start earning stamps and showing them off, too. Q: How will I find my Stamp Book? A: Just click on your player card. 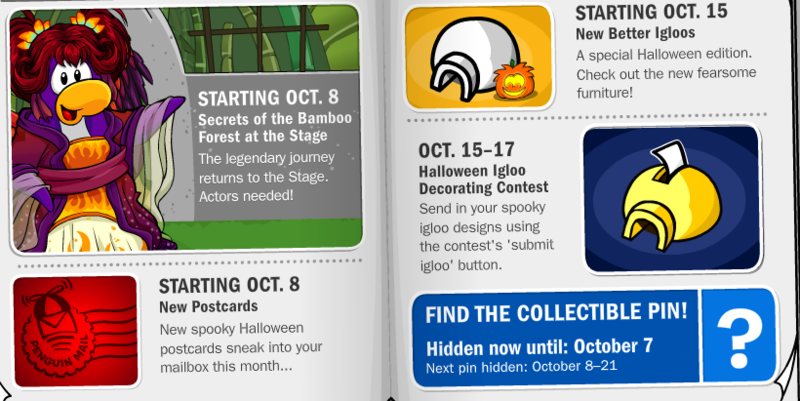 When you do, inside the book there are places for a whole bunch of stamps – and descriptions of how you can earn them. Q: How do I earn Stamps? A: Lots of different ways! There are easy stamps and extreme stamps, stamps you have to earn with buddies, and ones that you’ll earn by showing off your skills in games. 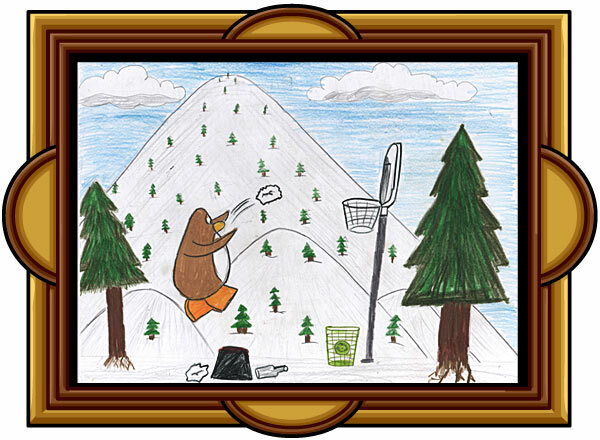 For example, to earn this stamp, you’ll have to jackhammer at the ‘berg with 30 penguins. Q: Can I still get pins? A: Yep, you sure can! Pins aren’t going to change. And the best part is you can show off your ENTIRE pin collection inside your Stamp Book. I would love to see a Stamp for making lots of candy pizzas. What would YOUR ultimate Stamp be? 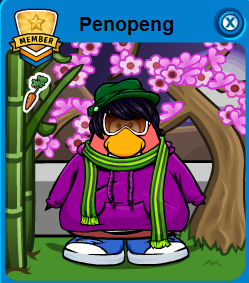 Penopeng on New Pin Location!